A heart valve allows blood flow in only one direction through the heart, and the combination of the atrioventricular and semi-lunar heart valves determines the pathway of blood flow. Valves open or close based on pressure differences across the valve. The atrioventricular (AV) valves separate the atria from the ventricles on each side of the heart and prevent backflow of blood from the ventricles into the atria during systole. The subvalvular apparatus describes the structures beneath the AV valves that prevent the valves prom prolapsing. Valve prolapse means that the valves do not close properly, which may cause regurgitation or backflow of blood from the ventricle back into the atria, which is inefficient. The subvalvular apparatus includes the chordae tendineae and the papillary muscles. The AV valves are anchored to the wall of the ventricle by chordae tendineae (heartstrings), small tendons that prevent backflow by stopping the valve leaflets from inverting. The chordae tendineae are inelastic and attached at one end to the papillary muscles and at the other end to the valve cusps. Papillary muscles are finger-like projections from the wall of the ventricle that anchor the chordae tendineae. This connection provides tension to hold the valves in place and prevent them from prolapsing into the atria when they close, preventing the risk of regurgitation. The subvalvular apparatus has no effect on the opening and closing of the valves, which is caused entirely by the pressure gradient of blood across the valve as blood flows from high pressure to low pressure areas. The mitral valve is on the left side of the heart and allows the blood to flow from the left atrium into the left ventricle. It is also known as the bicuspid valve because it contains two leaflets (cusps). The relaxation of the ventricular myocardium and the contraction of the atrial myocardium cause a pressure gradient that allows for rapid blood flow from the left atrium into the left ventricle across the mitral valve. Atrial systole (contraction) increases the pressure in the atria, while ventricular diastole (relaxation) decreases the pressure in the ventricle, causing pressure-induced flow of blood across the valve. The mitral annulus, a ring around the mitral valve, changes in shape and size during the cardiac cycle to prevent backflow. The ring contracts at the end of atrial systole due to the contraction of the left atrium around it, which aids in bringing the leaflets together to provide firm closure during ventricular systole. The tricuspid valve is the three-leaflet valve on the right side of the heart between the right atrium and the right ventricle and stops the backflow of blood between the two. The tricuspid valve functions similarly to the bicuspid valve except that three chordae tendineae connect the cusps of the valve to three papillary muscles, rather than the pair that connects the bicuspid valve. Blood passes through the tricuspid valve the same as it does through the bicuspid valve, based on a pressure gradient from high pressure to low pressure during systole and diastole. The reason that the valves have different numbers of leaflets is not fully understood, but may arise from differences in tissue structure and pressure that occur during fetal development. The atrioventricular valves, the bicuspid (mitral) and tricuspid valves, separate the atria from the ventricles. The bicuspid valve is on the left side of the heart and the tricuspid valve is on the right side of the heart. Blood flows through an atrioventricular (AV) valve when blood pressure in the atria becomes high during atrial systole and blood pressure in the ventricles becomes low enough during ventricular diastole, creating a blood pressure gradient. Papillary muscles, finger-like projections from the wall of the ventricles, connect the chordae tendineae (heartstrings) to the cusps of the atrioventricular valves. This connection prevents the valve from prolapsing under pressure. Papillary muscles, together with the chordae tendineae, make up the subvalvular apparatus. 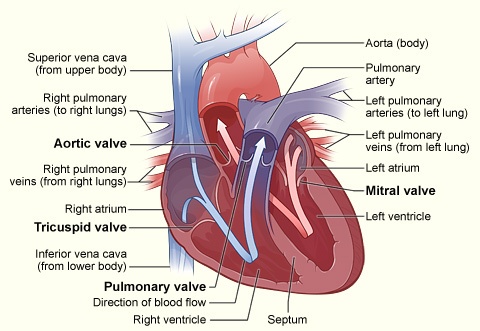 Atrioventricular valves: These valves separate the atria from the ventricles on each side of the heart and prevent backflow from the ventricles into the atria during systole. They include the mitral and tricuspid valves. Subvalvular apparatus: The papillary muscles and the chordae tendineae, known as the subvalvular apparatus, hold the valves closed so that they do not prolapse.